Lest we forget – Remembrance Weekend saw staff and pupils at Stonyhurst College and Stonyhurst St Mary’s Hall remembering those men and women who have lost their lives in service. 273 former Stonyhurst pupils lost their lives in the Great War and in conflicts since then. Over the last four years every one of them has been remembered individually in the College assembly closest to the one hundredth anniversary of their death, and, over the last two days, collectively. Stonyhurst St Mary’s Hall arranged 176 crosses in the form of a poppy, which everyone passes as the enter and leave the school. These represent 168 Stonyhurst old-boys who died in the Great War and eight members of staff who left their employment here to volunteer. In addition, Stonyhurst St Mary’s Hall parents funded the purchase of two “There But Not There” statues, which now stand by the school’s entrance – one guarding the 176 crosses and the other standing by the Centenaries Theatre. On Friday 9 November the Last Post was sounded from the Top Gallery as the whole of the Stonyhurst St Mary’s Hall community gathered in silence around the main stairs. During the two minutes silence, poppies cascaded through the stairwell down to the Lady Statue. The total silence and falling poppies made this a moving experience. 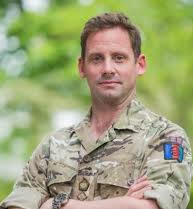 On Friday, the Stonyhurst College Combined Cadet Force (CCF) represented CCFs in the Northwest region along with Army Cadet Force, RAF and Sea Cadets, Regular and Reserve Forces. at the Festival of Remembrance at Preston Guild Hall, organised by HQNW. Four Junior Under Officers from the Sixth Form at Stonyhurst College read a citation given for Maurice Dease for his VC, and Wilfred Owen’s The Sentry, accompanied sotto voce by the Band of the King’s Division. Sunday 11 November saw the blessing of the wreath, carried by Junior Under Officer Timmins, followed by a service of remembrance in Hurst Green. The Senior Company of Stonyhurst College’s CCF paraded with standards in the annual Hurst Green Remembrance ceremony, with Junior Under Officer Robert Kellet laying the wreath. 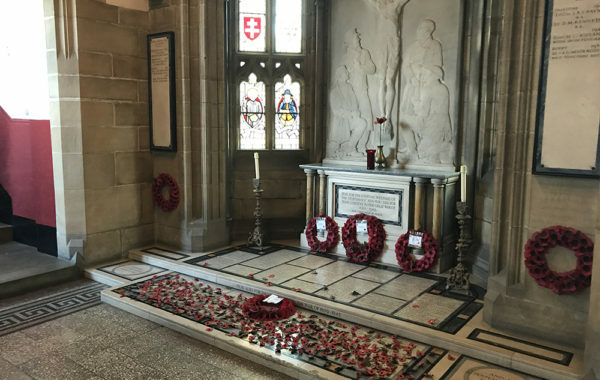 A private service at the College’s war memorial took place on the morning of Monday 12 November to commemorate former Stonyhurst pupils (OS) who lost their lives in the Great War or while serving their country more recently.